Just finished editing the audio – yes, audio. Unlike the the campaign appearance that Bill Richardson had in February here, I was only one of about 400 attendees to this meet & greet. Sen. Edwards was forthright, passionate, articulate and exceptionally patient with a crowd more interested in getting their own issue out in front of the crowd rather than focusing on the (blandly named) topic of the event: “Women’s Issues“. Seriously, if I’ve found anything true about geeks and liberals – we have a habit of making discussions into issues on our own pet projects. Sen. Edwards knew it was going to happen though, rolled with it, and made the best of a discussion that was altogether much too short, and a bit more controlled than I would have liked. What came from the discussion was Sen. Edwards absolute dedication to the eradication of poverty – particularly the poverty of single-parent families being headed by women – in the United States. Concurrent was his concern for people serving in the Armed Forces, the absolute necessity for getting out of Iraq, universal heath care for all Americans, the discrepancies in arrest & prosecution rates of black men, and and even touching on immigration. Click here for the audio of the event (hosted by Archive.Org, MP3 format). Senator, a few months ago your campaign was in a ugly situation concerning two women hired to coordinate the Internet portion of your campaign. What would you do in the future to guarantee that strong women with firm opinions not be chased out of the American discourse? As discussion progressed, another question popped up – Sen. Edwards is very insistent that immigrants learn to speak English as part of the legalization and naturalization process. If you forward on to about 25 minutes in, you’ll hear the question as well as his response – and the absolutely thunderous response he got for his insistence. Just a few minutes prior he was remarking that the bottom wage-earners couldn’t make the ends meet on one job – it’s not uncommon for both citizens and illegal immigrants now to work more than one job. Workers making minimum wage or slightly better working 60-80 hours a week – and sometimes less in the case of some service jobs as waitressing and in illegal employment. Sen., I can certainly understand why you, and obviously this room, empathetically demand that immigrants learn English. But considering the nature of low-income work and the absolute necessity of working more than one job to make ends meet, how will these immigrants find the time during the day to learn English? Will you advocate a national program to teach English to adult immigrants? Coming out of the forum, it’s pretty obvious why John Edwards is as popular with the netroots as he is – he’s adopted a strategy of plain speaking and forthright opinions as to what he stands for. He’s unabashedly liberal, and he’s pushing for a withdrawal from Iraq with all possible speed. 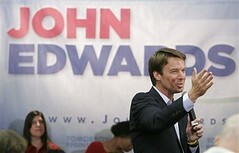 In essence – Sen. Edwards has certainly built his campaign as a progressive version of Howard Dean’s 2004 campaign. However, as nonpartisan noted the other night (and a number of others have echoed), they’re not in love with Edwards like they were with Dean. Dean was something special . . I can empathize. Dennis Kucinich in my home was a breath of fresh air in 2004 and my wife and I worked hard for the campaign and worked as delegates all the way up to the state convention. But now I’m just ambivalent about Dennis in the race. As much as I want to love Edwards’ and his positions — maybe the heart shouldn’t have such a pre-eminent position in supporting a political campaign. Sometimes, the first crush is the hardest. And Edwards knows this – what he’s betting on is that we can learn to love his vision in a relationship ruled by both heart and mind. And he’s willing to keep wooing us until we give in. This entry was posted on Saturday, October 6th, 2007 at 9:37 pm and is filed under Uncategorized. You can follow any responses to this entry through the RSS 2.0 feed. Responses are currently closed, but you can trackback from your own site.